Sometimes you just need cheese, cream and butter. That was the general consensus at my house Friday night, so we cooked up a bubbling, cheesy, creamy dish of macaroni and cheese. I found a recipe on Martha Stewart’s website which apparently came from singer-songwriter John Legend. It had an interesting ingredient which I haven’t seen before, but which now seems so blatantly brilliant that I’m sorry I didn’t think of it: evaporated milk. 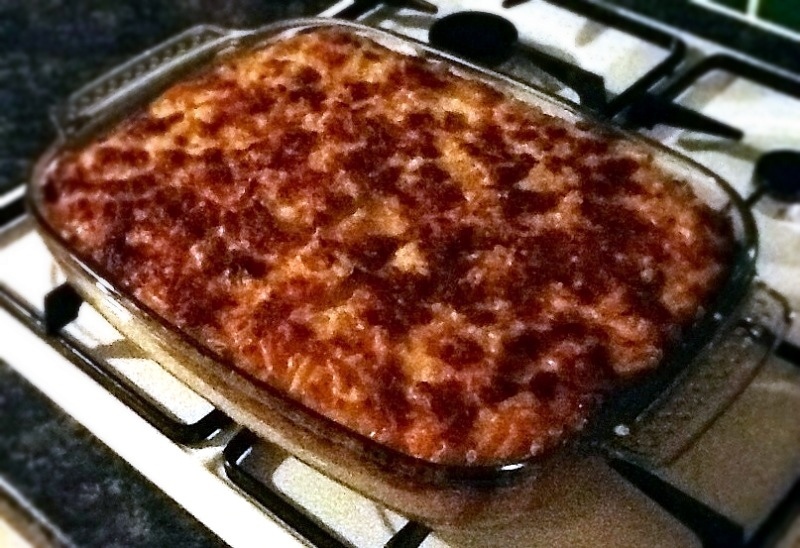 It was a dish of three parts: milky mixture, buttery pasta and grated cheese. Pasta and cheese are layered in a buttered dish and then the wet ingredients are poured over. The amount of pasta in the recipe barely made enough for a single layer in the 13×9 dish called for, so I had to make the same amount again to finish the dish off (6 cups total). All the other quantities are correct. 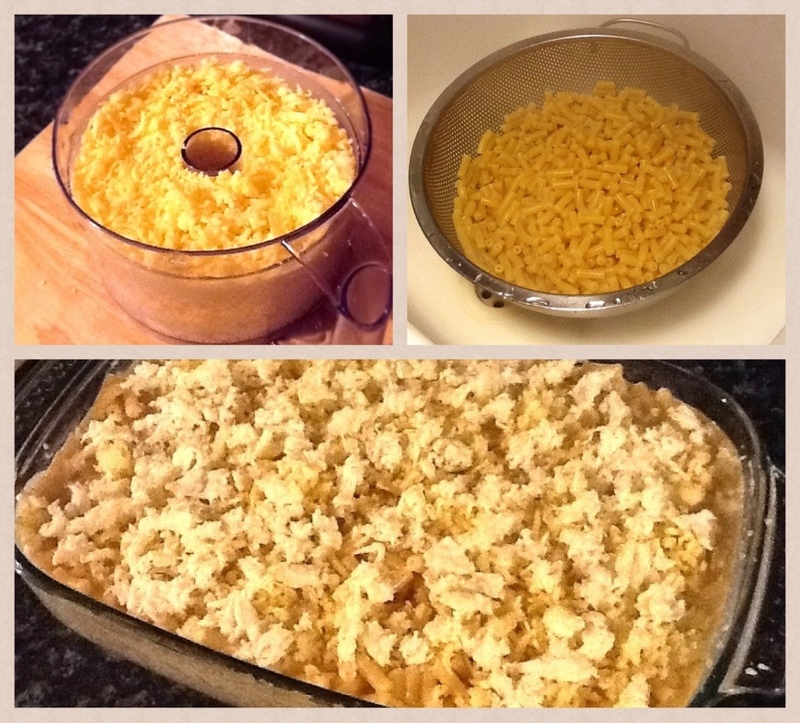 The evaporated milk, regular milk, eggs and seasoning, which are whisked together into a thick milky mixture, luxuriously absorb into the al dente pasta and the cheese melts into it which means that when you unearth the mac n’ cheese from the dish it is all of a piece, moist and deliciously cheesy. Buttering the dish beforehand creates a golden crust on the edges which is pleasantly crunchy and caramelised. 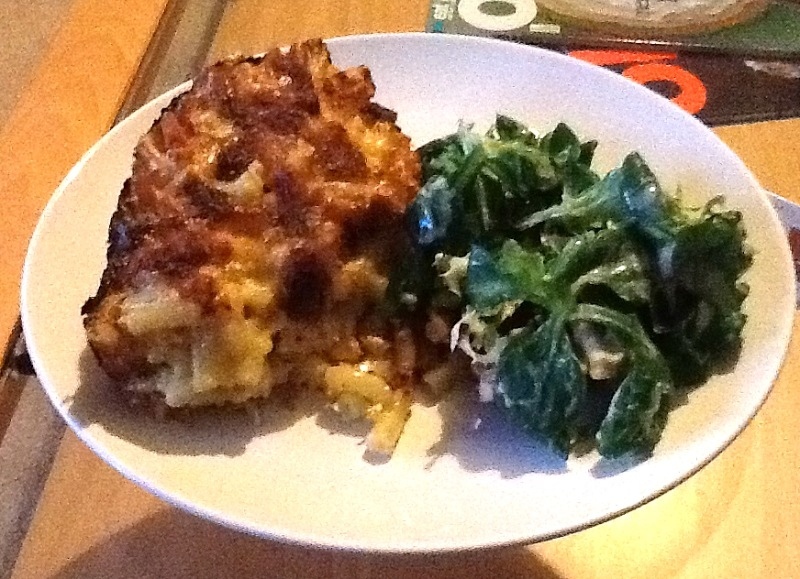 I used three different cheeses, none of which were those called for in the recipe, which all worked together really well. For the cheddar, the main cheese, I used Ashmore Farmhouse which is an unpasteurized cheddar-style cow’s milk cheese made here in Kent by the Cheesemakers of Canterbury. It has won several awards and was voted one of the top 50 cheeses in the world in 2012 at the World Cheese Awards. A 3kg wheel of this was the base of our wedding ‘cake’ in October and it has lasted beautifully well in wedges in the freezer, so it was the obvious choice for a cheddar substitute. Instead of Monterey Jack, I used gouda because it’s soft and mellow – and because I’ve never seen Monterey Jack here in the UK. Lastly, I tore up a ball of mozzarella for the top layer which I think raised the browning factor on the top. I served it with a light green salad of mixed leaves with a Dijon mustard vinaigrette, both to assuage our guilty, cheese-laden minds and for a bit of acidity to cut through the creamy pasta. I will definitely make macaroni and cheese this way in the future, but not for a while because we have enough leftover to feed us for a month! nothing like crunchy, melted cheese on pasta! Thanks, Em! Can’t wait for April, so much to catch up on! Totally going to follow her, I’d love to love bacon and not be fat! I’ve just made this and agree that 3 cups of pasta wasn’t enough. I followed the recipe to the T, but the milky/cheese combo looks a tad like scrambled egg. Doesn’t taste of it. Just wondering if anyone else found this. I will say it’s not a good as I thought it would be. Bummer. My milk mixture was smooth, so not quite sure what happened there. Sorry it didn’t quite go to plan. Yeah, let us know. I want you to like it too! I’m so glad to hear it! Wonder what went weird, but at least it worked out for leftovers! Going over it in my head, I think I need to adjust the temp a bit more than I reckoned for my fan-assisted oven. The corners seemed to be where the unusual parts were. The middle was lovely. Good point! I’ve overcooked things before too in our fan oven, I think it’s generally supposed to be that you reduce the temperature by 20 degrees or so (Celsius).